Our Gift Hampers speak for themselves. 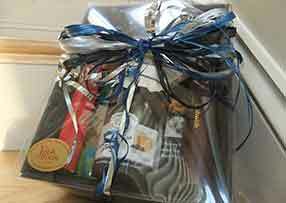 Customers return year after year to order their Christmas hampers as well as ones for birthdays and anniversaries. Recipients of our Jug & Bottle hampers have been so pleased with their gifts, that they too come to us and order for the friends, families and colleagues. 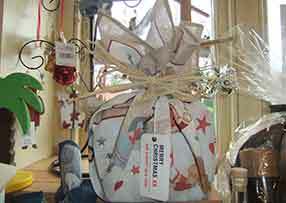 Hamper are so easy here at The Jug & Bottle; whatever you choose we’ll wrap it for you. But if you want to take the burden our of your shopping we can select the goods and wrap them for you. All you need to do is pay on order and collect. We can create, if you’d like us to, theme hampers for example “Chocolate Lover”, “Granny”, “Adventurous Cooks”, “Beer Lovers” and so on. You can make suggestions too likes red wine and more sweet toothed than savoury. We have always wrapped them in baskets covered in cello and ribbon, but a few years ago we introduced our EcoBags where everything is individually wrapped and placed inside the bag. The bag is closed with a bow and a tag. The recipient then has a useful shopping bag to use after they’ve eaten all the content! 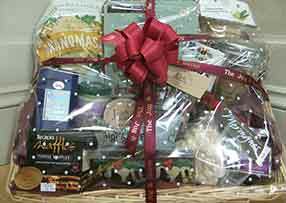 To order a hamper, stop into the shop, or give us a call or email.